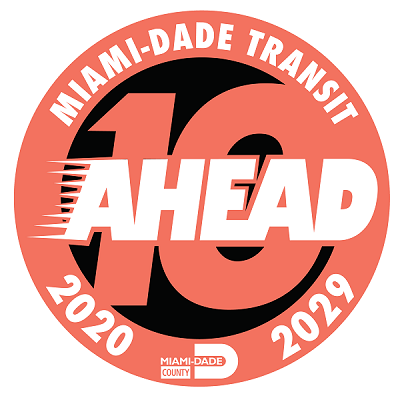 Miami-Dade County’s Department of Transportation and Public Works’ (DTPW) Transit Development Plan (TDP) is a ten-year strategic vision that helps the Department operate and grow a clean, safe, convenient, and reliable transit system. The TDP evaluates DTPW’s existing transit system, identifies existing and future service improvements as well as capital investments, and in the end it presents a financial plan based on available funding. Look for one of our community events. Follow us on social media at @GoMiamiDade on Twitter, Instagram, and Facebook. Use #MDT10Ahead to join the conversation. Recommended Service Plan: The ten-year implementation plan guides decisions about existing and future services. The plan is based on service standards, citizen input and stakeholder coordination. Capital Investment Plan: This plan prioritizes investments in buses, stations, infrastructure, and equipment needed to preserve and expand the transit system needed to implement the Recommended Service Plan. Financial Plan: The financial plan identifies all available financial resources and identifies financial needs based on the Recommended Service Plan and Capital Improvement Plan. Miami-Dade County provides equal access and equal opportunity in employment and does not discriminate on the basis of disability in its programs or services. Auxiliary aids and services for communication are available with five days' advance notice. For material in alternate format (audiotape, Braille or computer disk) or other accommodations, call 786-469-5225 or email Marcos.Ortega@miamidade.gov. These are the Transit Development Plans submitted by Miami-Dade Transit starting in 2009.